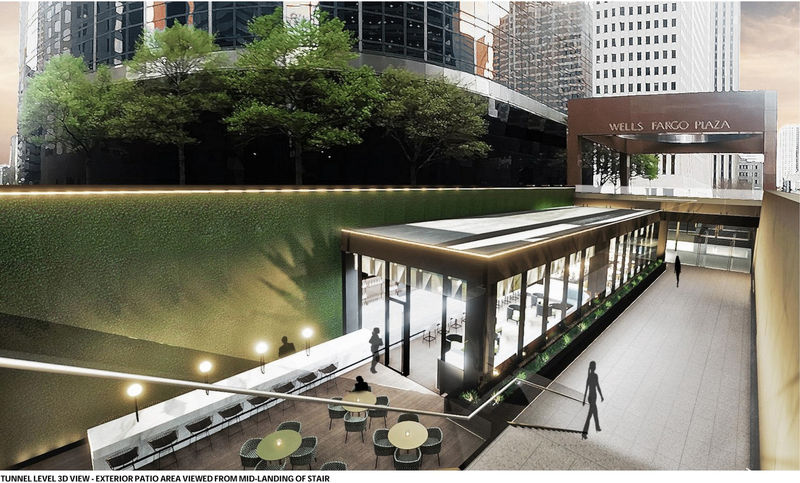 Rendering of resturant that will open in Wells Fargo Plaza. HOUSTON – (Realty News Report) – Adair Concepts, a Houston restaurant group, will open a new restaurant in 71-story Wells Fargo Plaza at 1000 Louisiana Street in downtown Houston. The eatery will serve breakfast, lunch, and small bites along with premier wines, spirits and signature craft cocktails in the afternoon. The 4,628-SF restaurant, designed in collaboration with Gensler and McGarr Design & Interiors, will be open from 7am to 7pm. Adair Concepts is led by siblings Nick Adair and Katie Adair Barnhart. In addition to Adair Kitchen, located in the Galleria area, Adair Concepts owns Eloise Nichols Grill & Liquors, and Houston’s first all-day cafe, Bebidas. In January 2018 Adair Concepts took over management of Skeeters Mesquite Grill and Los Tios Mexican Restaurants from their father Gary Adair’s Adair Family Restaurants. These family-owned restaurants began with the opening of Skeeter’s Mesquite Grill in 1988. “This is a significant addition to Wells Fargo Plaza and unique to the Central Business District. Our driving goal behind the addition of this amenity was to provide our tenants and others nearby with a place to meet clients over a coffee, lunch or a cocktail. We want this to be the number one downtown destination to meet a client or celebrate everything, from a promotion to the closing of a major transaction. The Adair family has a highly established reputation and will be the perfect fit for this location,” said CBRE Senior Vice President Marilyn Guion. CBRE’s Dave Hanusa and Ms. Guion are the exclusive leasing representatives for Wells Fargo Plaza. CBRE also handles property management. Notable tenants include Wells Fargo Bank, PWC and numerous AMLAW 100 law firms. The 1.7 million SF Wells Fargo Plaza, which opened in 1983, was developed by Century Development and it is currently owned by a MetLife joint venture. CBRE recently announced that the Sidley Austin law firm recently leased an additional 30,000 SF in the tower to expand their offices to 80,000 SF in the building.